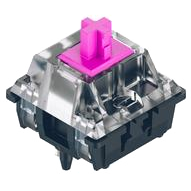 The MOD switch was built with the keyboard community in mind. The switch was designed by the Korean community. A linear switch with smooth POM stems and lubrication on the side which joins together to make a very soothing and silky feel. These switches are similar to the Cherry Red. They are perfect for the light typists who needs that bit of weight.